On Saturday 13 July, over 100 Volkswagen Group South Africa employees reported for volunteer action in a bid to uplift the town centre of Uitenhage by cleaning and beautifying Algoa Road. The operation, covering over a kilometer from the Goodyear intersection to Innes School, included a major clean up of the road’s verges, weeding, trimming of trees and removal of rubbish. The old municipal concrete bus shelters along Algoa Road also received a makeover of vibrant murals celebrating the spirit of community giving, whilst an impressive indigenous garden was landscaped at the Innes School intersection. The flagship installation of the ‘Operation Algoa Road’ volunteer action however, has been the creation of a 300 square meter public park and rest area in honour of Nelson Mandela. The project is Volkswagen volunteers’ special gift to Madiba in celebration of the bright rainbow nation he has nurtured. The International Nelson Mandela Day volunteer action marks the 9th community volunteer project initiated by Volkswagen in 2011 in their Show of Hands employee volunteerism campaign. Nearly 1,000 employees have participated in the campaign to date. “Volkswagen is proud to have taken action for Madiba this week and we hope the project will inspire more positive action in Uitenhage by our corporate and community neighbours,” added Maliza. 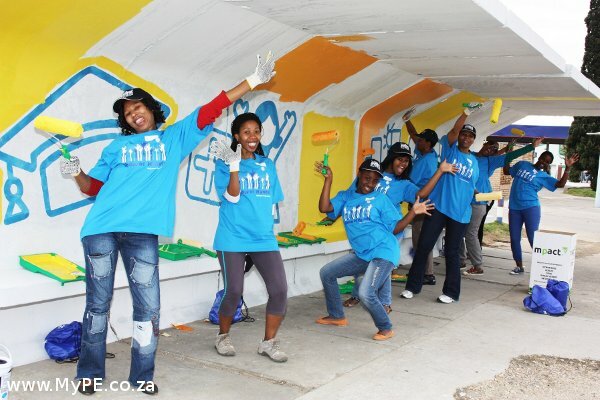 The Show of Hands volunteers beautifying the bus stops along Algoa Road, Uitenhage.